POTUS: Carli, what have you been eating? 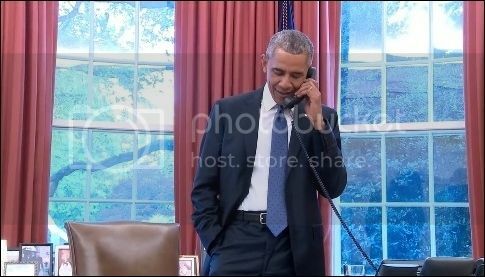 July 8 - United States President Barack Obama called the United States Women's Soccer Team to congratulate them on winning World Cup 2015. The President said, among other things, that he would last only 30 seconds with on a field with Carli Lloyd, and pointed out that the team's 5-2 championship game win over Japan on July 5 was the most watched soccer event in the United States. The President also said that the team's performance in the World Cup "inspired a new generation of young women." He also invited the team to the White House to celebrate the championship and "meet you guys and see the cup. And please just basque in the glory. You guys deserve it, and we're all really proud of you." To that, head coach Jill responded: "Thank you, Mr. President, we can't wait for you to rock one of our jerseys. We'll be there." Here is the tweet from the president's official twitter page with the video of the entire conversation. This is well deserved. Everyone was into this team this year. It's amazing time for women in sports in the United States right now and these players are the reason. that was a fun exchange to watch. i'm really proud of this team!